Pattadakal, in Karnataka, represents the high point of an eclectic art which, in the 7th and 8th centuries under the Chalukya dynasty, achieved a harmonious blend of architectural forms from northern and southern India. 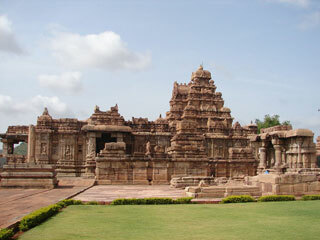 An impressive series of nine Hindu temples, as well as a Jain sanctuary, can be seen there. One masterpiece from the group stands out - the Temple of Virupaksha, built c. 740 by Queen Lokamahadevi to commemorate her husband's victory over the kings from the South. This article uses material from UNESCO World Heritage List article "Pattadakal", which is released under the Creative Commons Attribution-Share-Alike 3.0 IGO License.